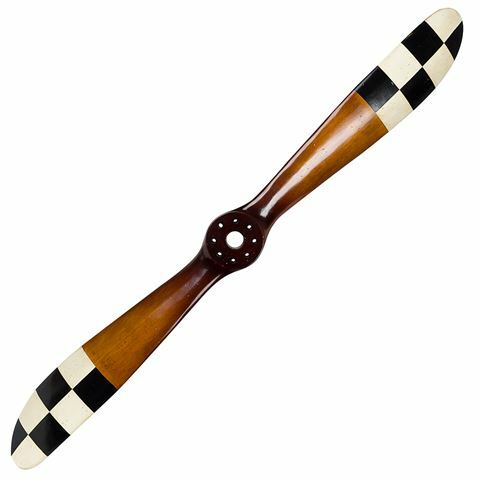 Styled after the early stunt planes from the World War I era, this Barnstormer Propeller is the perfect decorative piece for the aviation enthusiast in your life. Crafted from solid pine wood, this stunning piece harkens back to the early days of flight and features a sleek distressed honey finish. With carefully painted tips and an included bracket for hanging, this piece will have your living space feeling like a vintage cockpit. Crafted from solid pine wood. Broad propeller blades taper to a solid circular centre. Propeller tips are painted with a black and white checkered design. Comes with a bracket and screws for hanging. Design: Black & White Checkered.